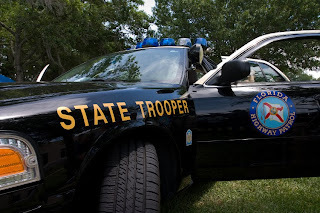 During the month of February, the Florida Highway Patrol (FHP) joined forces with the Alabama and Georgia Highway Patrols in an awareness and enforcement campaign for the Move Over Law. The campaign was conducted over a 29 day period and a lot of drivers found out about the Move Over Law the hard way. Many Americans are unaware that the Move Over Law even exists. Forty nine states have some form of the law and, in Florida's case, the law will celebrate its 10th anniversary this year. The law was created to protect law enforcement and emergency personnel who are assisting other motorists by the side of the road. The law requires motorists, when they see an emergency vehicle, with its emergency lights flashing, to move over into the lane farthest from the emergency vehicle or, if they can't move over, to slow down to 20 mph under the posted speed limit until they are safely past the emergency vehicle. Emergency vehicles include police, fire/rescue and tow trucks. The law was passed in response to the high number of emergency personnel who are struck and killed each year while working alongside the roadway. On average, at least one emergency worker a month is struck and killed while working on the side of the road. More than 170 police officers have been killed since 1999. In January, a veteran Atlanta police officer was killed as she was getting out of her patrol car at the scene of an interstate collision in downtown Atlanta. During the February campaign, the FHP issued 1,266 citations for violation of the Move Over Law. In addition, they issued more than 69,000 traffic citations, with almost 24,000 for speeding and made 620 arrests for DUI. Don’t wait to get a citation to learn about the Move Over Law. You can find out more information on your state’s Move Over Law by visiting http://www.moveoveramerica.com.